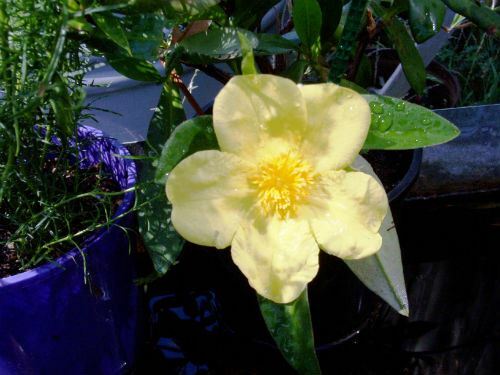 Hibbertia scandens, The Climbing Guinea Flower, as the common name indicates is a vigorous climber with stems that may reach five metres in length. Ovate to obovate leaves are up to nine centimetres long, three centimetres wide, dull green above and silky-hairy beneath. Large flowers are about seven centimetres across, bright yellow and solitary. Sporadic flowering occurs throughout the year. H. scandens is an eye-catching species with its large flowers. The Climbing Guinea Flower is a versatile plant as well as being a dense climber it is often grown as a ground cover and will cover embankments. H. scandens has an interesting distribution and is found in NSW, Queensland and the Northern Territory. It was introduced into England in 1790 as H. volubilis. The species name means climbing. Propagate from cuttings that strike readily.